16 November 2018: Two faculties from the University of Canberra are joining hands to provide holistic mental health support for drought-affected rural communities, with a caravan of researchers leaving for the pilot Creative Arts and Rural Health Initiative (CARHI) in Condobolin on Sunday, 18 November. 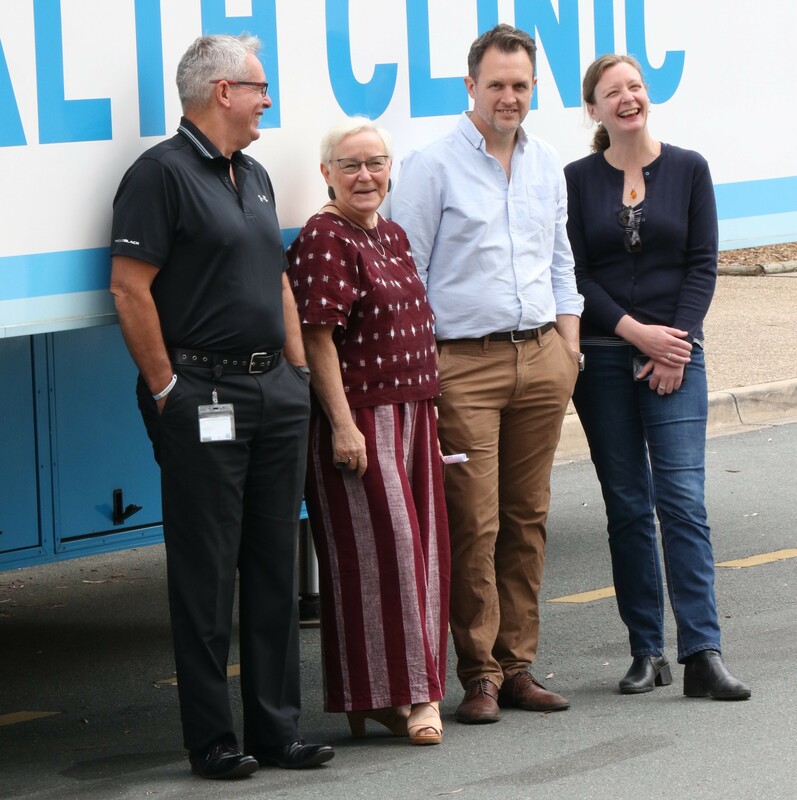 Faculty of Arts & Design (FAD), and Faculty of Health staff and students will be travelling to the rural NSW town in the University’s Mobile Health Clinic. The big white-and-blue health hub will serve as an easily-recognisable nerve centre for many of the week-long program activities, which will run from 19 to 23 November. Some of the CARHI team members heading to Condobolin this weekend (L-R): Mr Ian Drayton, Dr Jordan Williams, Dr Dean Buckmaster and Dr Kate Holland. “When it comes to drought relief, many people have jumped onboard to provide food etc. These are all great efforts, but I think we need to look at what’s going on in the mental health space as well,” said Ian Drayton, Strategic Projects & Business Development Manager at FAD. Dr Dean Buckmaster, Senior Lecturer in Psychology at the Faculty of Health, couldn’t agree more with the need for an emphasis on the psychological impacts of the drought rural communities. “According to 2016 statistics from the Centre for Rural and Remote Mental Health, suicide rates outside Australia’s greater capital cities are 50% higher, comprising 42 per cent of suicide deaths nationally,” he said. “As locations become more remote, the death rate from suicide and self-inflicted injuries goes up. This seems to result from a combination of relationship breakdowns and financial stress. “The bottom line is that for many rural families, there will be no harvest because of the drought, and therefore little to no income. This then ripples outwards to affect the whole community,” Dr Buckmaster said. The CARHI project will address both immediate and long-term issues. “The drought isn’t going away any time soon, and farming families and communities especially are really doing it tough – we need to be thinking about long-term, ongoing initiatives,” said Mr Drayton. Funded by the National Farmers' Federation, the program has at its heart a series of creative arts workshops. These will be informed by the ARRTS creative arts recovery program that the University has run for Department of Defence veterans suffering from trauma and Post-Traumatic Stress Disorder. “We’ve had quite a lot of experience working with our veterans’ program, and after seeing the effects of the drought in Western Queensland and NSW, I knew we could transfer some of aspects of that project to a program to alleviate drought impact on mental health,” said Mr Drayton. “It’s going to be a very exciting, dynamic project,” said Dr Jordan Williams, Associate Professor of Arts and Communication at FAD, who is heading the arts team for the project. The project team will be running both creative writing and visual arts workshops. “Participants can talk about the problems they’re facing – but they don’t have to. Because it’s a non-threatening space though, we find that people often do end up sharing what’s on their mind, and that can be very helpful in itself,” Dr Williams added. “In our project team, we also have researcher Paul Collis, a Barkindji man, who will be conducting writing workshops for teenagers, and well-known art therapist Bridie Macgillicuddy,” she said. To build on community engagement, the project will see a mix of pre-planned and responsive workshops. “It will be like creative bungee-jumping, for us facilitators!” said Dr Williams. While the creative workshops run, clinical psychologists from the Faculty of Health will be providing free mental health services to the community, and conducting a needs analysis across Condobolin. “This is about casual, empathetic relationship-building and collaboration,” said Dr Buckmaster. The ongoing program will likely include skills training to build psychological and emotional resilience in dealing with stress and managing relationships. National Farmers' Federation President Fiona Simson said that prolonged dry times take a toll on more than the landscape and the bank balance.